The Skagit Valley tulip fields haven’t quite reached their peak but early April is a perfect time to see the Daffodils. We drove through the valley yesterday afternoon and John was patient enough to stop the car twice while I tip toed through the mud in order to get a few pictures of these amazing yellow fields. We’ll be back here again next week and if the weather cooperates I’ll have plenty of tulip photos to add to my collection. Stay tuned! Posted as part of Lens and Pen by Sally’s Phoneography and Non-SLR Digital Devices Photo Challenge. What a lovely field in bloom. Thanks LD, I couldn’t capture how big the field was but the sight was wonderful. Wonderful perspective to show off these beauties! I’ll be looking forward to more. 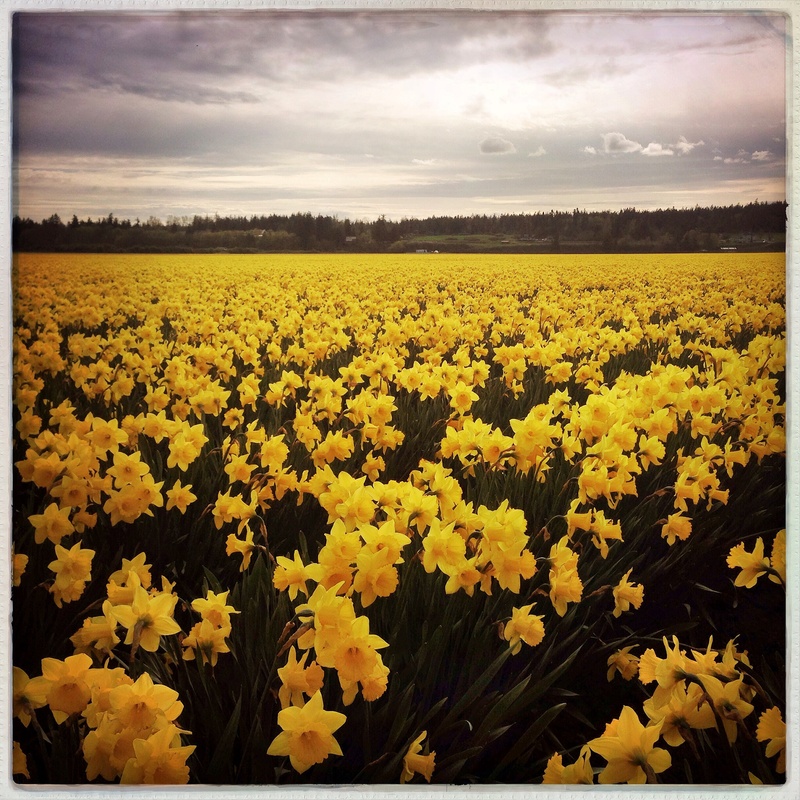 Wow…I’ve never seen a field full of daffodils like that! It’s wonderful to see them this full and large! So beautiful and reminds me of the sunshine and beautiful spring days. Absolutely fabulous. I wish I were traveling up that way right now. Would love seeing this. Please, please try to capture the tulips in bloom also. I have to live vicariously through you! What a terrific field with a spring blaze of color–must have been joyous in personal. Wonderful—Happy Photo Challenge. Thanks so much Sally, joyous is a great word to describe these fields. I love tulips too. 🙂 Thanks for visiting today! That’s what I said when we stopped the car! Wow, Lisa, how beautiful! Reminds me of the fields of sunflowers we see in South Dakota in the summers. Glorious. Thanks Janet and I’d love to see a field of sunflowers! That is an amazing picture. I bet it smelled wonderful too! Thanks Seonaid. 🙂 The yellows were so cheery I thought they brightened up a cloudy afternoon. Oh, gorgeous! Nothing like a field full of flowers. Thanks Alexandra! It’s a beautiful place but the flowers are only blooming for a short time. Soon they will be cut and then the bulbs are harvested for sale around the world. Oh this picture makes me happy! Yay. 🙂 It makes my day to know I shared happy thoughts! Awwwwwwww! I want to be there! We never did. I wish we had! I’ll have to look that one up, thanks for the tip! Thanks Meghan. 🙂 The cloud cover was getting heavy when I took this one and I must say I like the view better in this light than in bright sunshine. This weekend should be fun! Wow – what a wonderful sight! Beautifully captured. I’m happy to hear you like it!